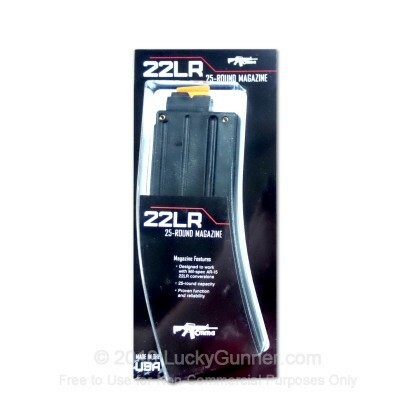 This polymer body magazine is designed for use with the CMMG AR-15 .22 LR Conversion Kits and Upper Receivers and will hold 25 rounds of .22 LR. This full-sized design can be used with all your existing pouches and magazines carries for training purposes and includes the taller bolt-catch follower which interfaces with CMMG's bolt hold-open actuator (BHOA) in order to hold the action open after the last round has been fired. Got two magazines. Shipped quickly. Ran a couple hundred rounds through each magazines with no problems. Greater price. I have 8 of these and they work great with CMMG .22 conversion in a M&P 15. I have not had any issue other than bad rounds. I like this ammo but is a little expensive and works well on my rifle! * The note attached to the magazine was quite telling. Plan on spending a little time on each magazine sanding them to fit. Loading magazines while wayching TV and then taking them to the range made the purchase worth every penny. Put several hundred rounds through all 8 magazines and have not experienced a single issue. Great product! I bought this to try because my issue Ceiner could not reliablely feed an entire magazine in my AR.this works flawlessly ! !